We support young farmers and ranchers and women's leadership programs. We provide lesson plans, teacher training, and scholarship opportunities to promote food and farming education. 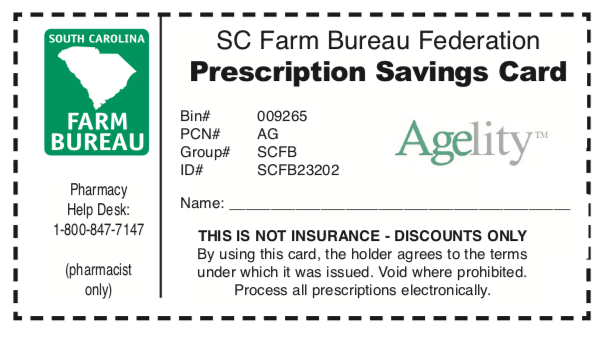 Membership in SC Farm Bureau is your key to savings. Save on insurance, automobiles, farm equipment, travel, and a whole lot more. It doesn’t cost to be a member, it pays. Be sure to review the instructions associated with each discount to understand how to redeem the discount. New benefits are being added all the time so make sure you check back to explore our growing list. Get $750 bonus cash toward the purchase of a new Lincoln or $500 bonus cash on your new Ford purchase. Access your certificate online or see your authorized Ford or Lincoln Dealer for qualifications and complete details. *Program 36238/33695: $500 Ford Bonus Cash offer and $750 Bonus Cash offer exclusively for active SC Farm Bureau members who are residents of the United States. Offer is valid through 1/2/2020 for the purchase or lease of an eligible new 2019/2020 Ford or Lincoln vehicle. This offer may not be used in conjunction with most other Ford Motor Company or Lincoln Motor Company private incentives or AXZD-Plans. Some customer and purchase eligibility restrictions apply. Must be a member for 30 consecutive days prior to purchase. Limit one Bonus Cash offer per vehicle purchase or lease. Limit of five new eligible vehicle purchases or leases per Farm Bureau member during program period. Not available on Shelby GT350®, Shelby® GT350R, Mustang BULLITT, Ford GT, Focus RS, F-150 Raptor and F-150 Diesel. Visit your local branch, order by phone at (877) 620-2852, or shop online. Register for a Farm Bureau account or use SCFB account number: 802160051 to start saving today. *Free standard shipping on all orders shipped ground transportation. Other freight charges will be incurred for services such as expedited delivery, special handling by the carrier, sourcing orders and shipments outside the continental United States. Get exclusive member discounts at Office Depot and OfficeMax. Our members have access to over 93,000 items discounted up to 80% off retail price, including office and cleaning supplies, technology, and furniture. Visit us online to print a free in-store discount card, or to create an online account where your discounts are automatically applied. Online orders over $50 receive free next-day delivery (excludes furniture). The Farm Bureau Products Program saves you money on a number of expenses. For more information, or to order, call (800) 849-3778 or browse all our products online. South Carolina Farm Bureau members save $500 per unit on the purchase or lease of Case IH Maxxum® tractors; Farmall® C series utility, U series utility and 100A series tractors; self-propelled windrowers and large square balers. A $300 per unit incentive is available for Case IH Farmall® C series compact and Farmall A series utility tractors, Case IH Scout® utility vehicles and other hay tools, including round balers, small square balers, disc mower conditioners, and sicklebar mower conditioners. Visit your dealer, make your best deal, and then present your discount certificate to subtract another $300 - $500 from the bottom line. Your certificate, along with valid ID, must be presented to the Case IH dealer in advance of delivery to receive the discount. If you have questions or need help obtaining the certificate, please call or visit your local FB office. Save up to $2,500 on Cat® excavators, skid steers, wheel loaders, and more. South Carolina Farm Bureau members can save up to $5,000 on the purchase or lease of eligible Cat wheel loaders, small and medium dozers, backhoe loaders, compact track loaders, multi terrain loaders, skid steer loaders, telehandlers, mini hydraulic excavators and excavators. Members also receive an additional $250 credit on work tool attachments purchased with new Cat machines. These discounts can be combined with any current retail discount, promotion, rebates or offers available through Caterpillar or its dealers, with the exception of the Cat NCBA membership incentive. You must present the certificate at the time of purchase or lease quote to receive the discount. One certificate required per machine. Eligible Farm Bureau members may obtain an unlimited number of certificates, but certificates do expire. If you have questions or need help obtaining the certificate, please call or visit your local FB office. *You will need your unique seven-digit membership number (e.g. 0234567) to access this member benefit. South Carolina Farm Bureau members are eligible for a complimentary John Deere Rewards upgrade - Platinum 2 status - which unlocks the best loyalty rewards including valuable equipment discounts. Register today, and explore all that Rewards has to offer. An accidental death Benefit is included with each Farm Bureau membership at no extra cost. The benefit is provided under a policy issued to the county Farm Bureau by South Carolina Farm Bureau Mutual Insurance Company, and it provides coverage in the amount of $1,000 on member and spouse and $500 on each dependent child under 21 residing in the household. Membership dues must be paid on or before the due date. Please contact your county Farm Bureau office to make a claim. Agents offer an extensive line of insurance products, including Auto, Home, Life, Health and Farm Property. Retirement planning and annuities are also available. Our Customer Service Call Center is available 24/7 to offer friendly, convenient service. And our six conveniently located Claims Service Centers help resolve your claims quickly and fairly. Call (800)799-7500 or visit our site. For more information, contact your local Farm Bureau Agent, or speak with a Personal Banker at (800) 492-3276 or visit our site. AirMedCare network, America's largest air medical membership network, provides the highest levels of care and access for you, your family, and your community. Protect what matters most with an AirMedCare Network membership. Farm Bureau members receive an exclusive discount. Call (800)793-0010 for details. Use the Coupon Code 12615-SC-BUS. Save up to 50% off the national average cost of LASIK Eye Surgery with QualSight LASIK. We also accept Flexible Spending and Health Savings Accounts. Call (866) 979-9212 or visit our site. An emergency medical alert system provides security, peace of mind, and independence for the ones you love. Ask about our new mobile system with GPS (works inside & outside the home). Call (877) 288-4958 any time or visit our site. Take advantage of the Clear Value Comprehensive Hearing Benefits for Farm Bureau members and their families. Call (888) 497-7447 or visit our site to access your benefits. Print the card below and locate a participating pharmacy to receive your discount. Ask them to enter the info into their electronic billing system. The card is not an insurance benefit and will not offer additional savings on pharmacy discounts offered through insurance plans. Get 15% off MSRP, plus free freight and setup to dealer location on any new Grasshopper Zero Turn Mowers. Discount also applies to implements and accessories with purchase of a new tractor and deck. Membership proof required. Find your nearest dealer or call (620) 345-8621 to get your discount. SC Farm Bureau members qualify for a Free Security System valued at not less than $850 and receive a free smoke detector or key fob when they become ADT subscribers through PowerLink, the most tenured ADT dealer in America. Add to that $2 – $5 monthly discounts on monitoring, 40% off additional equipment, and a $99 installation special. Not available to current ADT subscribers or anyone who is within 90 days of terminating an ADT contract. Call (877) 289-4070 for details. Over the last 20 years, Dungarees has been established as a retail leader in the work wear industry. Save 10-20% on the most premier brands like Carhartt, Wolverine, Yeti, Cat and more. Visit our site and use discount code SCFBF. Save up to $25 off the front gate price. Log in to purchase your tickets online. Save up to $25 off front gate price. Log in to purchase your tickets online. Visit our customized SpiritLine Cruises site to save $5 off per person for up to 6 people on Harbour Tours, and save $10 off per person for up to 6 people on Dinner Cruises. *Saturdays and special events do not apply. Click to buy daily admission. Enter discount code 'SCFB,' then apply now. Complete billing information, review, and complete order. Print ticket vouchers and enjoy the day! Purchase your tickets online and use the code 'SCFB' to save 20% off general admission tickets. *Please note, the discount only applies to online ticket purchases and tickets must be printed prior to your arrival. Save 20% when you purchase your ticket online. Purchase your tickets online with the promo code 'scfarmbureau18' or print out this coupon and use it at the gate. Members save on standard rates at participating Choice locations worldwide. The discounts are available only by making reservations in advance by booking online at Choicehotels.com or by calling (800) 258-2847. Enter SCFB Special Rate ID (00209800) in the assigned field. Click “yes” to confirm you are a member and then click “Find Hotel” to make your reservation. To take advantage of this valuable travel discount rate please call 877-670-7088 to connect with a dedicated travel expert and be sure to mention you are a Farm Bureau member (code #1000000510) or go to www.wyndhamhotels.com/farm-bureau to book. Save up to 20% no matter which way you decide to book your vacation with discount. SCFB members save up to 25% off Budget base rates with your Budget Customer discount (BCdD) number Y775700. Plus, get other great offers like dollars off, a free upgrade, or a free weekend day. Visit our booking site or call (800) 527-0700. For your next rental, save up to 25% when you mention AVIS Worldwide Discount (AWD) #A298840. Call AVIS at (800) 331-1212, or visit our booking site. Start planning your trip online or call (844)367-6433 and mention you're an SCFB member.